Looking for a wedding reception idea? We have seen many different wedding receptions over the years, and we hope to give you a few suggestions. We often hear from couples that their wedding day was a blur. Our best advice is to take a few moments during the reception to take it all in. Step back and watch what is happening around you. Enjoy the menu you selected, have a few drinks and enjoy the time with your family and friends. It will only last a few hours, so enjoy it! Start planning your wedding reception early. This includes thinking of a wedding reception idea for flowers, centerpieces, cakes and decorations. It is also a good idea to book your wedding vendors as early as possible. Florists, cake designers and entertainers (DJs and bands) tend to book well over a year in advance, so don't wait too long or you might not get your first choice. 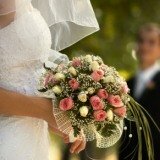 In addition to the ideas listed below, get even more wedding ideas at wedding-planning-101.com. Or you could also check out My Wedding Reception Planning for more wedding reception ideas. Have a wedding reception idea or questions? Ideas For Decorating Your Church. For those that don't want a formal wedding affair. For a touch of good luck on your big day. Add a Celtic twist to your wedding day. A beautiful addition to your wedding day. Make this your first stop to learn the basics of planning your reception. Help your guests find their seats. Festive ideas for holiday centerpieces. Photos and ideas for A fall wedding. 3 Ideas For Using Water. 8 ideas for your wedding. 7 ideas for you to use. From simple to extravagant, come up with a wedding centerpiece that your guests will fight over. Combine them for a unique alternative. 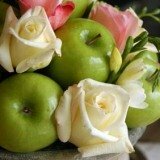 4 Hints For Using Flowers. A smaller option for your cake. An Autumn twist for your cake. Perfect for beach and Hawaiian wedding themes. Give your guests their own cake. Here's the skinny on ideas for wedding cakes. All about wedding cake costs. Perfect for a country western wedding. The right florals can make a big difference at your wedding reception. Choose the right shade for your wedding. Ideas for your wedding bouquets. Are silk flowers right for your? Perfect for an Autumn wedding. Ideas for your fall wedding. Surround yourself with beautiful flowers. Brighten up your wedding day. Add some color to your wedding. Spring ideas for wedding flowers. Ideas for a summer wedding. Ideas for winter wedding flowers. Skip the sit down and extend cocktail hour. Choose the right menu for your wedding. Finish off your wedding with a creative cocktail. The party doesn't have to stop. Make your first night together magical. Capture the memories of your Irish wedding. The Balloon Decoration Guide offers detailed step-by-step instructions and photos on how to create your own balloon decorations to add a magical touch to your wedding reception. Rehearsal Dinner Ideas is a great page from CelebrationIdeasOnline.com. Find tips for managing your rehearsal dinner budget, choosing a venue and more! Have Questions or Ideas About Wedding Receptions? Do you have a questions or great ideas to share about wedding receptions? We want to hear about it! Leave your comments and tips on submissions from other brides, and they will do the same for you! To see questions that other brides have asked click here.